Here it is! I've teamed up with Aynabek from Back To Bek travel to create Yurts For Sale. We can ship these Mongolian-made Yurts worldwide! With your own Yurt you can instantly create your own weatherproof space or temporary accommodation wherever you like. The cool thing about Yurts is, you don't have to worry about construction permits, planning, or anything like that. Because it's only considered a 'semi-permanent dwelling' by every jurisdiction we know of. So anarchists and tax dodgers rejoice! Many of you will fall in love with the cosiness and simplicity of the Mongolian Yurt while you're over there on holidays. Mongolians hand these yurts down through generations. You know how extreme the heat can be in summer and the cold in winter, so they should certainly stand up to whatever conditions you can throw at it. Do note, these yurts are more suited to dry climates than super humid or tropical ones. You can read more about that on the website, but basically I wouldn't go putting one up in tropical Florida, and I'd take it down during a rainy Seattle winter, but most of Australia and the mid-west United States would be perfect! Yurts are made from a lattice timber frame which makes them more secure than your average house with windows. Over that there is a wool felt lining which helps insulate the yurt and keep it warm at night. Over that goes a waterproof layer. And then the white cover for aesthetic purposes. 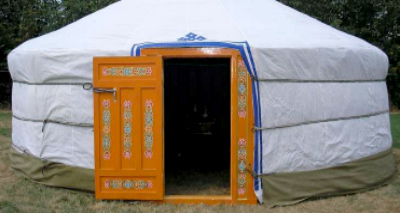 The yurts come with painted door and centre support poles. There's currently 3 different sizes to choose from at Yurts for Sale, you can sleep 4-10 people so it really depends what you want to use it for. The yurts at yurts for sale are made in Ulan Bator. So you'll be supporting Mongolian craftsmen. The other thing we're doing, is giving 5% of all profits to the Notre Dame children's orphanage in Ulan Bator. Which feels nice to help out these kids. So if you want to quickly build your own cosy living space, visit Yurts For Sale to check out the different sizes and prices. We ship free to anywhere in the world!